We welcome all boys entering kindergarten to fourth grade. Boys entering fifth grade must have completed Webelos I. We do not currently accept fifth graders new to scouting, but other packs may. Your son does NOT need to attend Coyote Creek Elementary School to join our pack. If you and your sons are interested, we will get you hooked up in no time. 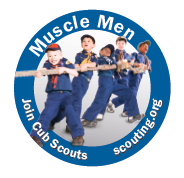 Please email us at cubmaster@pack1776.com with any questions you have.